We lost count on the number of pieces I have done for this client, not to mention for her parents and her friends. Word of mouth is the best compliment you can give! 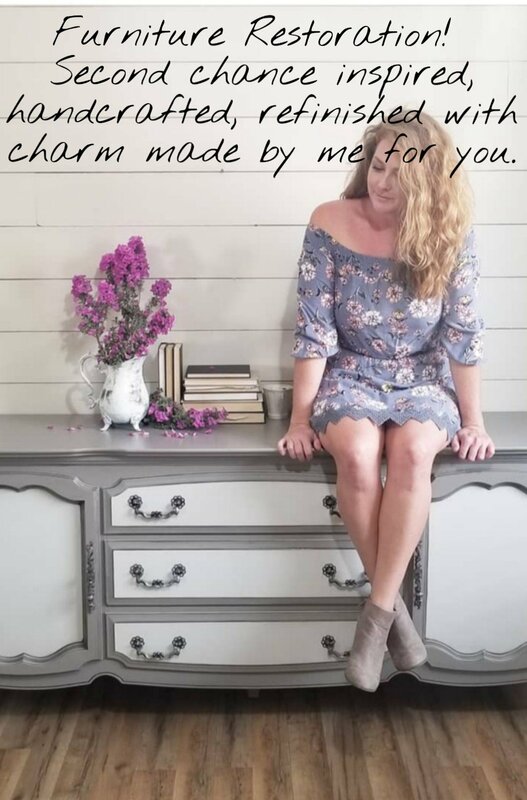 When a neighbor, friend or family member is visiting your home and states they love your *insert piece of furniture* and you have nothing but wonderful things to say about your Second Chance Charms piece- I seriously am on Cloud Nine. Over 90% of my clientele are referrals and the things they tell me, you say about working with me, or how your expectations were reached and then some, I smile from ear to ear and tears fill my eyes. I can not express how touched I am that you love something that I created with my hands, heart and soul. I am YOUR biggest fan!!! Thank you!!! We are finally getting to my lovely clients Display Cabinet in her house of Second Chance Charms. I can’t help but laugh- when she called me she said “I want to go blue”. There was a short pause on the line. She HATES blue. Of course she assured me that the blue she is going for is Frank Sinatra blue. I love her ideas and her colorful home. Refinished in a custom color mix by me using three different shades of Sherwin-Williams blues, I will call it ‘Frank Sinatra Blue’. Glazed in Brown and hardware revamped in champagne bronze. This lovely antique cabinet came all the way from California for a Second Chance! Once belonging to my clients mother she finally wanted to give her a new look. Over time this piece started to have its wear and tear, as you can see in the before pictures, and needed some help! Taking off the fabric backdrop and old veneer was a start! Refinished in Sherwin-Williams Indigo Batik and glazed in brown. My client has the glass door fronts at home as well as the glass shelves. I can’t wait to see what it looks like in her space! Most recent work! I have one last project to share before the new year. Hope you had a wonderful Christmas! This little custom cabinet has been revamped in a rustic look using a heavy glazing technique. Refinished in Sherwin-Williams Rookwood Terra Cotta and glazed in Van Dyke Brown. Added two little wooden knobs that were updated in bronze.